The Caverns at Natural Bridge is a family-friendly attraction located in Natural Bridge, Virginia. 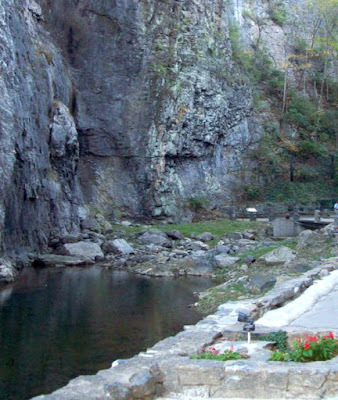 The caverns were discovered early in the 20th century and then officially opened as a park in 1977. It is open seasonally from March through November, depending on weather. You'll find the caverns, the Natural Bridge, a gift shop, walking trails, a picnic area and more...all located here! When visiting, you'll want to plan ahead and wear comfortable clothing and footwear. You'll be doing a lot of walking through the park and then descend down 34 stores into the cavern. They recommend that you wear tennis sneakers and bring along a light-weight jacket or sweater. The caverns maintain a year-round temperature of around 54 degrees. The guided tour will last for approximately 46 minutes and new tours begin every 30 to 60 minutes, with the last tour leaving at 4 PM EST. These tours can fill up fast, so during the peak of the tourist season & on weekends, you'll want to arrive early. If you plan on visiting ONLY the Natural Bridge Caverns the admission price is as follows: Adults $18.00 and Children ages 6 to 12 years of age $12.00 each. 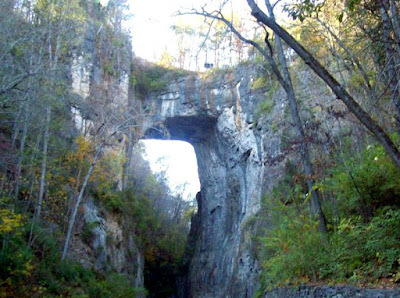 While you're there I recommend that you visit the nearby Natural Bridge. If you plan on doing that, you can purchase an adult combo ticket for around $20.00, which includes Cedar Creek Trail and the Monacan Indian ​Exhibit. 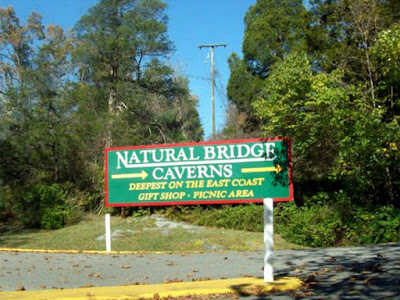 You can get all of the pricing details and tour schedule directly on The Caverns at Natural Bridge website. I took my camera down into the caverns and frankly, I didn't have any luck in grabbing some nice photographs. I should of taken my larger, more professional camera down there with me, instead of my easy-to-use point-n-shoot. If you have a nice camera, you should be able to get some decent photographs, but you'll need to use your flash because it's dimly lit in most areas. During our visit I really enjoyed walking the Cedar Creek Trail (beautiful walk) to reach The Natural Bridge. It's amazing that nature can create beautiful things like the Natural Bridge formation. It was a fairly easy walk and one that the entire family would enjoy. 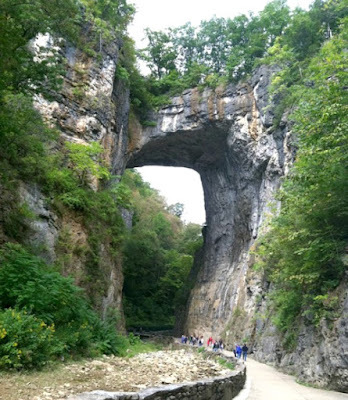 If you're going to be visiting the great state of Virginia or just passing through...a visit to The Natural Bridge and Caverns would be a great family-friendly activity for you to enjoy. We spent about 2 1/2 hours there before hitting the road again.